English Spoke is still going, slowly but surely. It wasn't finished by the end of London Olympics, but with only one sleeve left, it will finish soon. Towards the end of last week I started getting some tingling in the right forearm, and I cut back some TV watching and knitting. It certainly didn't help that Team China slowed down their medal-earning. 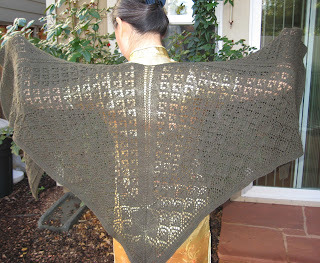 But I really want to tell you about the adventure of my Irish Diamond Shawl. The Irish Diamond Shawl is designed by Cheryl Oberle, published in Folk Shawls. I knitted mine in 2008 and wore it to Stitches West the following year to show Cheryl her wonderful work in real life. It's knitted in Newton Yarn Country's Cashmerino (50/50 cashmere and merino wool), so it wears like creamy butter. I love it dearly, and keep it in a nice big zip lock bag when I don't use it. The missing Irish Diamond somehow stopped me from planning other large shawls too, as if the new one would pack up and gone missing too. Last week I brought the question to my Ravelry friends. Should I tear the house apart till I find it? Should I wait for it to show up when it's ready? Should I pat self on the back for being a good process knitter and be content with the time spent working it? Or should I make a new one? A shocking number of people (134 votes!) told me to make a new one! Because that's the best way to make the old one show up. I still have Folk Shawls, and I started considering seriously what yarn to use for the replacement. In the mean time I gave it another chance and dug up large portions of the content of various closets. During the process I gathered two huge bags of blankets and linen to donate, plus a bunch of clothes and accessories. The big drawer lightened up quite a bit. I reached behind the drawer, yep, there it is. The zip lock bag slipped behind the drawer, caught by the backboard so I couldn't see it from any direction. Lesson learned: when in doubt, make double. Your Spoke is looking gorgeous, and I'm tempted to make one myself... so glad you found your diamond shawl, I would be VERY VERY upset if it was lost forever and I'd hate to make another for the precise reasons you said. Still, all's well in the end :) ... and nope, I still haven't found my buttons, I'll just buy some more. I'm so, so glad that you found it. Such a gorgeous shawl with a lot of hard work put into it, I would have been heartbroken too. But, having gone through a lot of the planning and everything, do you think you will make another one? Oh my, so glad the shawl is found! Pumpkin, I have other shawl projects that I've been wanting to do, and now I can seriously considering them. Very pretty! And glad you found it. I wish my missing Trindle would turn up now ... I think I'd cry if I lost a whole shawl, though! That sweater is just gorgeous. I love those bold colors! I'm starting to look forward to cold weather, so we can all wear our lovely knits! Isn't it funny how things sometimes 'disappear' for awhile?!? It seems like every time I organize things and put them away in 'logical' places, rather than the random spots I'm used to, I can never find them again! WOOHOO!!! You found it!!!! I'm so glad you did. It's gorgeous! Will you be starting another large shawl with this one being found? Geez, now I wonder what is stuck behind my drawers. I'm glad you found that gorgeous shawl and hooray for some cleaning too. Lynn, this certainly opens up possibilities. I'll probably do couple of small projects after the sweater, then think about big and/or heavy things in the winter. Found the shawl ... and did some "stuff" pruning in the process! What will you now make with the yarn you thought you were going to use for the second shawl? Did you even make a firm yarn decision? What a crazy story! I wonder if missing projects are related to the missing dryer socks?? So glad it finally decided to show itself, it's truly beautiful! VdV, I'm really pleased with my "stuff pruning"! We are a family of pack rats, no one wants to throw out anything. I hadn't make a yarn decision when the shawl was found. But then my yarn/pattern decisions are sometimes shaky until the project has a chance to prove itself. Around here, when something long-disappeared comes back to us, we say the Vortex coughed it up. Oh, Vortex, I'm still looking for my left Five Fingers shoe, please! Beautiful shawl. I'm so glad the Vortex gave it back to you.